Gran poder de absorción y ligero de peso; para capturar mosquitos u otros insectos refugiados en la vegetación. Con gruesa y larga manguera que permite recolectar cómodamente los mosquitos. Frascos de captura con filtro con malla de acero inoxidable. Hay que advertir que funciona con batería de 12 Voltios / 17 Amperios (diferente voltaje de las CDC normales). Incluye cargador de voltaje variable. Tardamos unos 15 días en servirlo. The battery powered Modified CDC Backpack Aspirator is a lightweight, durable, and comfortable aspirator for the collection of resting adult mosquitoes and other resting species. It has been very well received by agriculture as well as medical entomology researchers and surveyors. Battery powered aspirator for resting insects. Lightweight, durable, and comfortable to use. Includes a lightweight welded aluminum backpack frame. Universal voltage (100-250 VAC 50/60 Hz) battery charger with 5.0 Amp output, fuse protected and fan cooled. 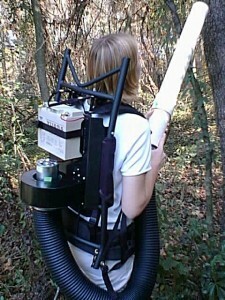 The CDC Backpack Aspirator was originally designed for the collection of resting adult mosquitoes by the U.S. Public Health Service. It is also used to collect other resting species in row crops, on ornamentals, from turf grass and other plants. The formed aluminum platten supporting the battery and suction motor is welded and aluminum power coated. It is lightweight, durable, and comfortable to use. 5 amps/hr universal and automatic battery charger. Input 100-240 VAC, 50/60 Hz. Lightweight welded aluminum backpack frame.